Sediments serve as an indicator of the state of the environment, as they reveal, anthropogenic influences (e.g. industry) over time. The knowledge about the composition of sediments, in particular by the speciation, helps in the assessment of the environmental situation. The speciation of mercury in sediments is still being discussed and continues to pose a great challenge for analytical chemists. Despite a broad number of publications in this area, there is no gold-standard about the speciation of mercury in sediments. The reason for this is the growing interest in new, better methods for the speciation of mercury, which increases the number of publications and the uncertainty among the analysts. Therefore, the methodology of mercury speciation in sediments requires improvement and would benefit from a standardized approach. The goal of this review is to give an overview of the existing methods and to discuss the issues of methodology. 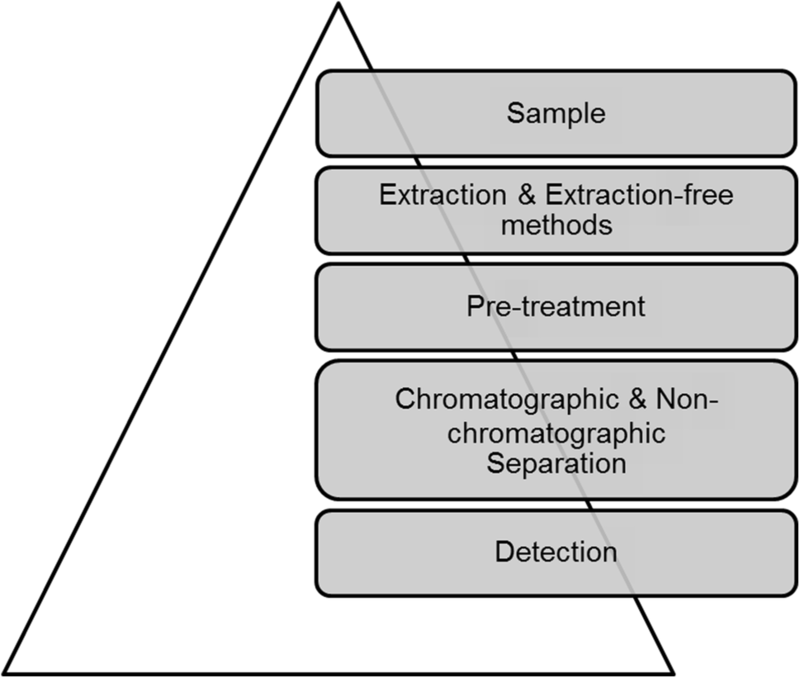 Discussed parts in this review article include: (1) available reference material, (2) the methodology of extraction, (3) enrichment procedures, (4) separation and (5) detection. 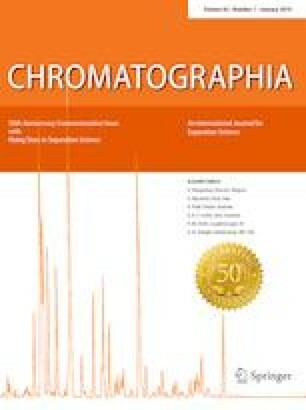 Published in Chromatographia's 50th Anniversary Commemorative Issue. Since decades, mercury has been an ongoing topic of discussion because of the environmental situation and has been of particular interest since the occurrence of Minamata in 1956 . Since then the World Health Organization (WHO) categorized mercury as one of ten substances that threatens public health . 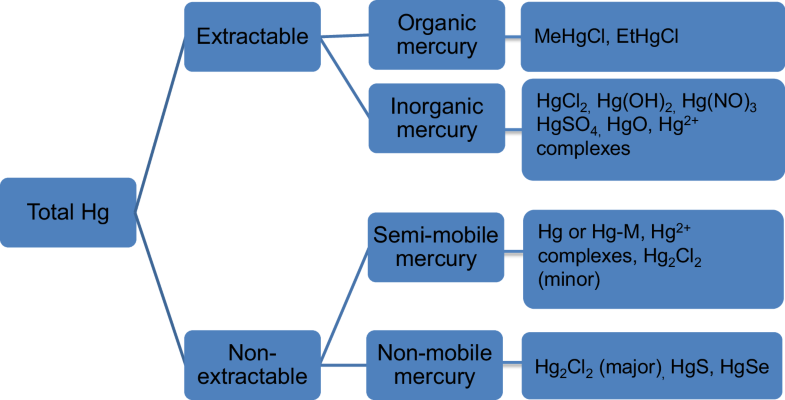 The occurrence of mercury can basically be classified into three categories by distinguishing between elemental mercury Hg(0), inorganic mercury Hg(I), Hg(II) and various forms of organic mercury CH3Hg+, (CH3)2Hg, EtHg+, PhHg+ [3, 4]. Elemental mercury is one of the elements which has a liquid aggregate state at room temperature. The main intake path for this species works via the lung because Hg(0) evaporates rapidly due to the considerable vapor pressure at room temperature. After resorption, it can pass the blood–brain barrier, as well as the placenta and then spread throughout the entire organism [5, 6]. Inorganic mercury compounds may be present in the oxidation states (I) and (II), whereby Hg(I), which is frequently present as calomel (Hg2Cl2), is poorly water-soluble, thereby being classified as safe . While the intake through the lungs and the digestive tract is variable, the dermal intake is irrelevant . Friberg et al. demonstrated that only 8% of dermally applied mercury chloride could be absorbed in 5 h .
Since there is already a very high risk potential in small quantities, organic mercury is of particular interest. While ethyl mercury is very rapidly degraded to Hg2+ , CH3Hg+ and (CH3)2Hg have special properties, which makes them among the greatest environmental threats. 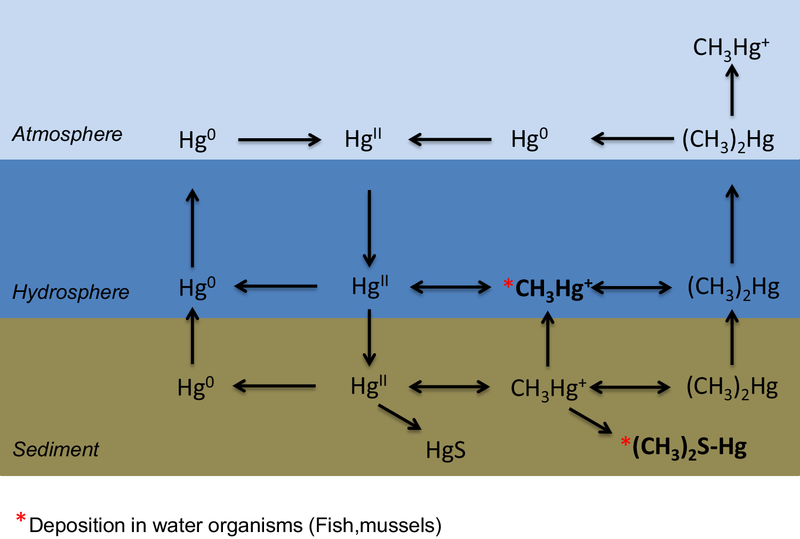 (CH3)2Hg has a particular influence on the distribution of organic mercury in the environment which can be explained by its volatility, water insolubility and non-existent affinity for thiol groups (–SH) . In contrast, the CH3Hg+ shows a high affinity for thiol groups. Since these are frequent components in proteins, the CH3Hg+ is found throughout the body binding sites. For example, it is passed through the cell membrane by the amino acid l-cysteine [10, 11]. The resorption pathways of CH3Hg+ are manifold, which means that they can be absorbed by the intact skin in addition to oral and inhaled uptake . Through anthropogenic (industrial processes, combustion processes, gold production, etc.) or natural (volcano, etc.) intake, mercury enters the environment and results in a biogeochemical cycle, which describes the distribution of the mercury species in the respective areas of the environment (Fig.1). While Hg(0) is predominantly found in the atmosphere, the dominant species in water is the inorganic Hg2+. This can be explained by the high concentration of salts (such as chlorides) which supports the oxidation of Hg(0) to Hg2+, as well as the presence of sulfides which interfere with methylation [13, 14]. According to the hard and soft acids and bases principle (HSAB), mercury is preferred in this respect for the formation of complexes with sulfur-containing ligands or organic material . Due to the fact that sediments are a natural source of these components, they are capable of binding heavy metals. A number of species can be found in soils and sediments. However, in contrast to other compartments, a different distribution of the species is present. For the conversion processes in these matrices, mainly the presence of organic material as well as the temperature is responsible. While in fish mainly CH3Hg+ is found [16, 17, 18, 19], this is only about 0.1–1% of the total Hg  in soils and sediments. On the contrary, there is a relatively high content of inorganic mercury, which especially leads to problems in the analysis of methyl mercury in sediments. Table 1 illustrates different mercury concentrations worldwide. By altering conditions such as pH or salt concentration, which affect solubility, mobility and bioavailability, the species can be separated from the sediment again . As a result, sediments are a permanent source of mercury in surface water . This leads to the interest in sediments which has increased dramatically in recent years. Figure 2 shows the matrices studied in the last decades . Because of the toxic differences and the occurrence of the species in the individual areas, speciation of mercury becomes indispensable, when a state of environment needs to be evaluated . A species is generally understood as the specific form of an element defined as an isotopic composition, electronic or oxidation state, and/or complex or molecular structure . The analysis can be divided into several sub-sections, which are shown in Fig. 3. For the analysis of mercury in sediments, all interesting mercury species have to be extracted with a suitable extraction method, enriched to determine also low concentrated species, chromatographic or electrophoretic separated and detected with an element-specific detector. There are already a number of methods for the speciation of mercury in sediments found in the literature. In the following, the individual sections of a speciation will be discussed and critically evaluated. This should help other analysts when developing a methodology. For the speciation of mercury, a special procedure with regard to sampling, storage and pretreatment of the samples becomes necessary. The samples are usually stored in containers made of polymer [35, 36], glass , PTFE or stainless steel . Yu et al. recommends to use PTFE, FLPE, PET, Pyrex glass and quartz to store samples. They are also pointing out that mercury loss has to be feared using PE containers [40, 41, 42, 43], since they promote species degradation. As a result PTFE containers should be preferred, which reduce adsorption on the surface and enhance the stability of the species . Despite the arguments against the use of PE containers for the speciation of mercury, acid-cleaned PE vessels has become established for the speciation in sediments [45, 46, 47, 48], since it has an stabilizing effect on the mercury species [39, 44, 49]. Basically, it requires a thorough cleaning of all components that come in contact with the sample. Cleaning procedures are performed, including aqua regia or nitric acid. In special cases, working in special clean rooms may be required. To avoid any contamination, the sample should be analyzed as early as possible after the collection or stored in a dark place at low temperatures (refrigerator) . In the literature it is also reported that a pretreatment of the sample with acids can minimize the risk of methylation . Common used acids are HNO3, H2SO4 or HCl, whereby studies show that nitric acid is the most effective additive . Furthermore, it is advisable to cover freshly collected sediment samples with a water layer for transportation . After reviewing the literature, it is evident that little is said about the treatment after sampling and before the analysis (e.g. sieving, drying, homogenization). Since these steps are also of particular importance with regard to the production of reference material, they should be given more attention. Due to the mentioned influencing factors, great care must be taken in choosing the right storage and pretreatment procedure. Legislation within the European Union provides that methylmercury has a proven quality in matrices such as food or environmental samples. To determine these, mainly suitable Certified Reference Material (CRM) is used. However, reviewing mercury speciation methods in sediments still poses a major challenge to analytics, which in turn is due to the difficult analytical conditions, the different species concentrations, the comparability of methods, the available reference material, or artifact formation . While a number of reference materials exist for marine samples such as fish or mussels, there is a lack of material especially for sediments. Some reference materials are used in the literature, which differ in their levels of mercury species (Table 2). While ERM CC-580 has very high levels of mercury, the concentrations in IAEA-456 are very low. Depending on the analytical conditions, the appropriate material can be selected. It should be noted, however, that in the case of using a higher concentrated reference material such as ERM CC-580, effects such as artifact formation may be observed, which do not occur with low concentrated real samples. In this context, the choice must be made very thoroughly. Due to possible species transformations also reference materials containing other mercury species are required. There are several methods in the literature using ERM CC-580 as reference material and numerous publications dealing with the origin and characterization of it [52, 53]. Fabbri et al. , who has been intensively involved in the characterization of this reference material, mentions that the sediment used for the preparation of the reference material has a high sulfur content. Accordingly, they conclude that the released mercury forms a complex with the available sulfur. HgS is non-mobile and thus remains inactive in the sediment. This suggests that the reference material CRM 580 used contains a low content of extractable mercury . This fact should be taken into account when using different extraction procedures. Since sediments differ from one another to some extent, the question here is whether the analysis of one reference material is sufficient for the statement about the quality of the measurement method. In this context, many working groups use sediment, which is artificially mixed with mercury standards. However, this approach leads to further uncertainty about the quality of the developed extraction method, since mercury-added sediment behaves differently when extracted than naturally occurring sediment . Under these circumstances, these methods should be chosen wisely. The extraction is the first essential step for the investigation of mercury species. This differs according to the matrix and, above all, poses a great challenge in the investigation of sediments. This is due to the fact that the concentration of methylmercury in sediments is less than 1% of the total mercury content . The challenge is to find an adequate extraction which enables high recoveries without losses or conversion. If sediments are investigated, consideration must be given to the different characteristics of the respective species (e.g. solubility), since this has an influence on the selected extraction method. Figure 4 gives an overview on the different species and their properties. In addition, the mobility, bioavailability and toxicity of mercury are determined by biogeochemical fractionation. For this reason, knowledge of the individual fractions is of particular importance . The behavior of mercury in sediments and the resulting fractions are influenced by factors such as total mercury, sulfur and iron content, pH, and organic matter [57, 58, 59]. Organic material occurring in sediments leads to the formation of complexes due to an interaction between its functional groups (e.g. carboxylic acids, phenols, thiols, alcohols) and Hg . Because of its chemical properties, mercury preferably forms strong ionic bonds with reduced sulfur groups found in dissolved organic carbon (DOC), including humic and fulvic acids [60, 61, 62]. As a result, poorly soluble mercury sulfides are formed . Adsorption effects can be observed in the presence of iron . In addition to these effects, the influence of the pH is often described. According to Manohar et al. low pH values (< 4) lead to a desorption of mercury. The reason for this is the increased positive charge of the organic material. However, it has already been shown in the literature that the influence of this parameter is rather low in case of mercury  and that the pH values are often above 4, whereby no desorption is to be expected . To distinguish between these different fractions, a Hg-specific sequential extraction can be used. While in sequential extraction the main aim is to extract the specific species successively, the mobility of all species of an element should be determined within the sample . Bloom et al. who developed a Hg-specific sequential extraction for mercury, presents a method by which mercury compounds can be classified into different classes using different reagents in various steps. The process leads to a distinction between (a) water soluble, (b) human stomach acid soluble, (c) organo-chelated, (d) elemental mercury, (e) mercuric sulfide. Although the use of sequential extraction is frequently used in the speciation of mercury, the general procedure already suggests some disadvantages. Therefore, it is very time-consuming  and often characterized by low reproducibility [68, 69, 70]. Furthermore, it is not entirely accurate since a change of the sample during this chemical treatment has to be feared [71, 72]. The literature also criticizes the non-specific removal of species during this procedure [71, 72, 73, 74, 75, 76]. Because of the arguments mentioned, single reagent extraction is preferred over sequential ones . The literature includes a large number of different extraction procedures, which can be categorized in acid leaching [27, 77, 78, 79, 80, 81, 82, 83, 84, 85, 86], alkaline extraction [55, 87, 88, 89] and distillation [55, 79, 90, 91]. When selecting the most suitable extraction method, the generation of artifacts must be considered. Artifacts are the unintentional transformation of one species into another, which can be caused by the sampling, extraction or separation method . Although the use of distillation leads to good recoveries for CH3Hg+ in sediments  and reduces matrix effects , more artifacts are formed compared to other extraction methods when analyzing samples with an Hg2+ content of ≥ 2 µg g−1 [55, 90]. If the content of the inorganic mercury is below the stated limit, the distillation is still a useful method . Due to the occurrence of a low artifact formation and good recovery  the acid extraction is used very frequently and results in many modifications. In addition to microwave-assisted [54, 80, 81] and ultrasound-assisted extraction  which are used to increase the speed and efficiency of the extraction [54, 94] the use of organic solvents is also often described [66, 79, 82, 87, 90, 95]. Table 3 shows an excerpt of the extraction methods available in the literature. When using acid extraction the right procedure has to be considered. Horvat et al. have found that pure extraction with HCl is not sufficient to quantitatively dissolve CH3Hg+ from the sediment. It was also shown that a decomposition of CH3Hg+ occurs above 4 M HCl. Hintelmann et al. determined that the extraction with HCl also leads to artefact formation. Bloom et al. showed that a combination of H2SO4, KBr, CuSO4 results in a good isolation of methylmercury from sediments, with no formation of artifacts. Some years later it was recommended to choose nitric acid for the extraction, since better recoveries for CH3Hg+ were observed, compared to other acids [80, 90, 92] and it shows little or no interferences to ICP-MS . Rahman et al. also demonstrated the impact of different nitric acid concentrations on the extraction efficiencies of both species. While an increase in the acid concentration results in better recoveries for Hg2+, a decrease was observed in the case of CH3Hg+. They supposed to use a concentration of maximum 4 M to get the best result for both species. Apart from acidic and distillative extraction, methods for alkaline extraction have also been mentioned in the literature. In particular, the use of KOH–methanol  and tetramethylammonium hydroxide  for the extraction of methylmercury from sediments and biological samples were described. 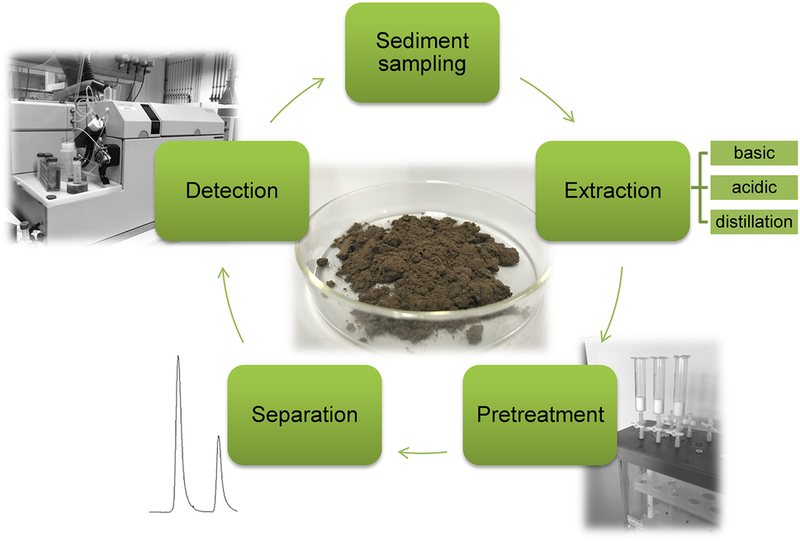 While this methodology works particularly well for biological specimens, problems occur when extracting sediments, which are associated with the presence of organic material, sulfides and iron . 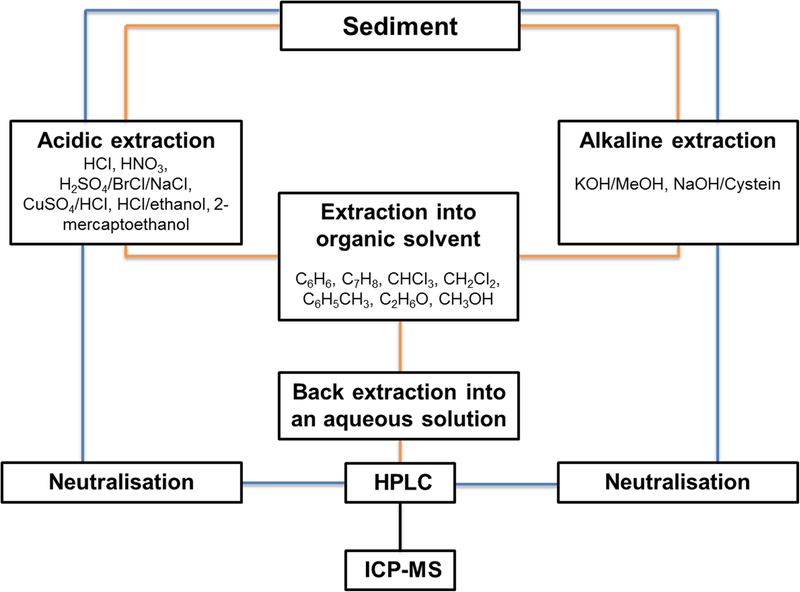 Figure 5 describes potential pathways for the speciation of mercury species with HPLC-ICP-MS. Basically, the speciation of mercury in sediments can take place in two different ways. Whereas in case of the simpler option the sample is directly measured after alkaline or acidic extraction and neutralization (blue line), variant two (red line) uses an additional organic extraction step after the first extraction, which should lead to a higher recovery of the methylmercury. Another way to analyze the mercury content is to use a direct mercury analyzer (DMA), as often described in the literature [80, 103, 104]. This measuring instrument is able to determine the mercury content of solid, liquid and gaseous samples by thermal decomposition, amalgamation and photometry. Although the main field of application is the total mercury analysis, speciation analysis is also possible. In a method according to Environmental Protection Agency (EPA) , speciation in sediments by a previous extraction and separation via SPE with subsequent analysis by means of DMA is described. In addition, this instrument has very low detection limits, down to the nanogram range. Because of its advantages in terms of speed, robustness and redundant sample preparation, it serves as a companion instrument in the speciation of mercury. Due to the above mentioned complications when using different extraction procedures, many researchers try to use extraction-free methods instead of using other procedures. In this context, X-ray absorption [71, 72, 105, 106, 107] and thermodesorption [73, 108, 109, 110, 111, 112, 113, 114] are often mentioned. X-ray absorption spectroscopy (XAS) is a useful tool for the nondestructive analysis of mercury compounds using high-energy X-ray radiation. The analysis does not require any chemical treatment, therefore, no change in speciation has to be feared. When using X-ray absorption, a distinction is principally made between X-ray absorption near-edge structure (XANES) and X-ray absorption fine structure (EXAFS), which produce different information about the analyte. While XANES can provide information about the state of oxidation and the geometry of the absorbing element, EXAFS refers to information about the direct neighboring elements of the absorbing atom . Although it is characterized by the peculiarities and advantages the analysis of mercury species requires at least a concentration of > 100 µg g−1 , which makes it useless for the analysis of environmental samples. In addition, due to similar spectra, the species may be misclassified . Thermodesorption is a further common technique for the speciation of mercury. The principle is based on the thermal release of the individual mercury species according to their desorption temperature and thus allows their differentiation and identification . The method is characterized by several advantages, therefore, it is sensitive, allows immediate identification and requires none or little sample preparation . Windmoller et al. could show that in case of Hg(0) concentrations in the µg kg−1 range can be detected . For the analysis of organic Hg species a previous extraction becomes necessary. Fernandez-Martinez et al. has presented a simple extraction consisting of an acidic extraction followed by organic separation using dichloromethane, which leads to satisfactory results. In contrast to conventional methods, the procedure is particularly fast and reduces artifact formation due to fewer steps . As a result this technique provides a simple and inexpensive alternative to the determination of organic mercury species. The unintentional generation of species transformations (artifacts) especially in sediments is well-known and results therefore to significant errors [20, 79].The reasons for an unwanted artifact formation are manifold but the literature suggests that artifacts occur during derivatization , separation  and extraction [20, 79]. Furthermore, it has been reported that formation of artifacts in presence of organic material [20, 85] and due to high amounts of soluble inorganic mercury [92, 119, 120] occurs, which means that the artifact formation must be strictly controlled during the analysis of sediments. For this reason, it is pointed out in the literature that the published results of methylmercury concentrations in soils and sediments must be used carefully . Since there is so far no extraction method without artifact formation, these often lead to a misinterpretation of the results, provided no correction has been undertaken. To check the extraction efficiency and artifact formation, the standard addition is often used. However, Liang et al. show that the addition of Hg(II) standards is not sufficient for the identification of artifacts. They observed that the behavior of Hg(II) standards in the sample and naturally occurring Hg(II) differs in the occurrence of CH3Hg+ artifacts . A much better and already established method for the control of artifacts is the species-specific isotope addition (SSIA) . This method allows correction of the measured methylmercury concentration by means of stable mercury isotopes. However, an ICP-MS is required for this application in addition to the acquisition of isotopic standards. On the basis of the difficult situation, it becomes clear that a prior examination of the measuring method for the analysis of methylmercury, in particular in soils and sediments, is indispensable. Therefore, it would be advisable to find a methodology with which artifact-free measurements can be carried out. A commonly used application for the speciation of mercury in sediments is the method according to EPA . This can be used as a guideline for the fractionation and quantification of mercury species and includes two approaches for the extraction of the mobile, extractable fraction and an enrichment method. The first approach describes the use of an acidic (4 M HNO3), microwave-based extraction. In the method it is stated that the extract finally contains the mobile, extractable fraction. For the analysis of the non-extractable fraction or the subdivision into semi-mobile and non-mobile, the remaining solid has to be treated further. Using this extraction procedure in our laboratory we found about 94% recovery for the inorganic mercury when analyzing the reference material CRM 580. These results suggest that the fraction found corresponds to the extractable fraction available in the reference material. Accordingly, in the reference material used, about 90% of the total mercury content should be present as the extractable fraction. Han et al. on which an extraction and enrichment method is based in the method according to EPA,focused on ultrasound-based extraction of mercury species using 2% HCl + 10% ethanol. In addition to suitable reference material (CRM 580 and SRM 2709), a direct mercury analyzer was used to validate the results. He was able to show that after extraction of the reference material CRM 580, only a content of 1.4 mg kg−1 of soluble inorganic mercury could be found, which corresponds approximately to a content of 1.1% of the total mercury content. He mentions that the remaining 133 mg kg−1 represent the non-extractable mercury. In view of the characterization of the reference material and the mentioned high content of sulfur complexes, the results of Han et al. appear to be more reliable. However, this does not mean that the microwave-based method does not work, but it should be noted in the method description that it can be used for methylmercury and the total mercury content—not only extractable mercury—otherwise, a faulty interpretation of the measured values may occur. This example is intended to illustrate the difficulties of using a method from the literature. Another very frequently used method for speciation of Hg in sediments is a combination of acidic and organic extraction [122, 123, 124], often just acid extraction [47, 125], followed by ethylation and analysis with GC-CVAFS. When transferring a method based on GC-CVAFS to an HPLC–ICP–MS system, special challenges often arise, as many diversions have to be accepted. Nevado et al. presented a procedure based on a microwave extraction including purification with dichloromethane and subsequent measurement by means of GC-AFS . For the transfer of the original method to an HPLC–ICP–MS system, which does not require any derivatization, especially the sample amount and the finally resulting concentration of methylmercury are crucial. Instead of the derivatization step, as mentioned in the original method, evaporation of the dichloromethane must take place with simultaneous uptake in an aqueous solution, to allow a direct injection afterwards. While the original method leads to satisfactory results (94 ± 4%)  and is considered as a possible universal method, the adapted approach leads to none separation, due to the high amount of inorganic mercury, and consequently making the quantification challenging. As a result, to simplify quantification when using the coupling of HPLC with ICP–MS a separation or enrichment method should always be used. These challenges should therefore always be remembered when transferring a method. Due to the very low contents of CH3Hg+ in sediments, the use of suitable enrichment methods is necessary despite the use of sensitive measuring instruments. Jagtap et al. were able to show that the high content of Hg2+ can also require a prior separation of both species since otherwise problems with the determination of both species can occur . There are several enrichment methods reported in the literature such as solid phase extraction (SPE) , solid phase micro extraction (SPME) , liquid phase microextraction (LPME) , dispersive liquid–liquid microextraction (DLLME) [129, 130], hollow fiber based liquid–liquid–liquid microextraction  and also purge and trap extraction (P&T) [132, 133]. SPE and SPME are techniques which lead to the separation or enrichment of species by the use of different stationary phases. The principle is based on the different affinities of the analytes to the stationary and mobile phases. In the context of mercury speciation in sediments, thiol-containing reagents such as dithizone, l-cysteine, 2-mercaptoethanol or sodium thiosulfate are often used. Table 4 shows a literature section of SPE applications for mercury species from sediments and biological samples. It should be noted, however, that despite the high number of enrichment methods, only a few are available for the analysis of sediments. Purge and trap is a further enrichment method, which is mainly used in combination with gas chromatography [50, 132, 133, 136]. This common used and effective method involves purging a sample (liquid/solid) with an inert gas (Ar, He, N2) to trap the volatile analytes on sorbents like Tenax [50, 133, 137]. Since this technique requires a cleaning step and a derivatization, other methods are recommended for the enrichment of mercury species. In addition to the above-mentioned methods, the LPME or especially the DLLME are frequently reported in this context. The latter makes particular use of chelating agents such as dithizone  or l-cysteine  when specifying mercury. This enrichment method has some advantages as it is characterized by high enrichment factors, consumption of little extraction agents as well as simplicity. The functional principle is based on the use of an extracting agent in combination with a dispersant, which is added to the aqueous sample and thus results in a satisfactory extraction. Because of the green chemistry thoughts and the consumption of different solvents, vortex  or ultrasound  is suggested . The usage of hyphenated techniques is very popular when analyzing mercury species. Especially for sediments and the small amount of methylmercury, a powerful separation technique is indispensable. 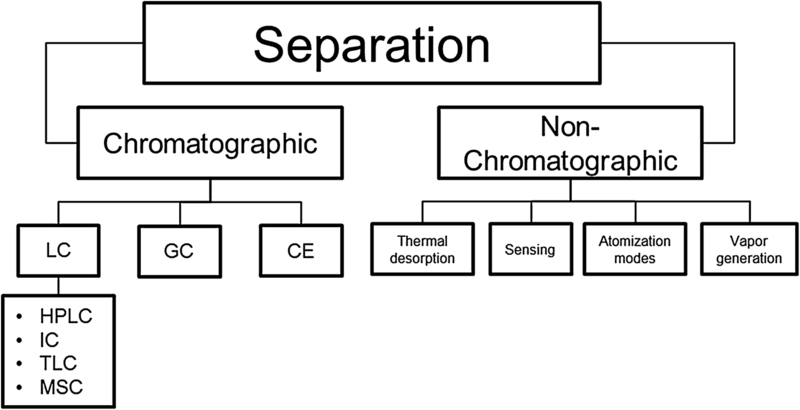 Some methods are described for the separation of mercury species during analysis, with a distinction being made between chromatographic methods like gas chromatography (GC) [140, 141, 142, 143, 144, 145], liquid chromatography, including high performance liquid chromatography (HPLC) [96, 146, 147, 148, 149, 150, 151, 152, 153, 154] and ion chromatography (IC) , capillary electrophoresis (CE) [156, 157, 158, 159, 160] and non-chromatographic methods involving cold-vapor (CV) generation [77, 161, 162, 163] or thermal desorption [73, 108, 109, 110, 111, 112, 113, 114]. Figure 6 shows an overview of the used methods. GC is one of the most well-known methods for the separation of mercury species and represents, especially in combination with ICP–MS or AFS, a powerful coupling for specifying Hg in complex samples. If ICP–MS is used as detection technique it is pointed out in the literature that GC is the best separation technique for this coupling due to its 100% sample introduction . Furthermore, it has a higher sensitivity  and better separation  compared to HPLC–ICP–MS, which can be of particular importance if sediments have to be analyzed. Table 5 illustrates some methods for specifying mercury with GC. But to utilize GC, a derivatization in form of aqueous phase ethylation [91, 143, 144], propylation  or phenylation  is necessary. The literature highlights the fact that this additional and complex step can lead to species transformation as well as losses and contamination of the sample [164, 166]. Therefore HPLC as a rapid, efficient and derivatization-free method is more often used. Despite of the lower sensitivity compared to other methods, the use of HPLC for the speciation of mercury offers a wide application range because of a higher variability in stationary and mobile phases . An overview of the broad application with HPLC for the speciation of mercury is given in a review by Harrington in 2000 . Table 6 shows an excerpt of LC based separation techniques. The HPLC methods mentioned in the literature for specifying Hg are based on reversed phase (RP)-stationary phases including C18 [127, 131] or C8 [78, 130]. To achieve good separation in RP-HPLC, methanol is an important component in many mobile phases. It could be shown that the methanol content has a crucial influence on the separation of mercury species . But when using ICP–MS, it has to be considered that the solvent content should not exceed 5%. Without an addition of oxygen to the plasma gas a higher concentration leads to instability of the plasma and deposits on the cones [175, 176]. In consequence there are limited possibilities to separate the species. Therefore the use of sulfur-containing additives, such as 2-mercaptoethanol [78, 98, 177] or l-cysteine [147, 149, 150, 168], plays an important role when specifying mercury. Rai et al. were able to confirm the importance of these substances by showing that adsorption effects can be prevented by the use of l-cysteine in the mobile phase . Depending on the used compounds a change in elution order can be observed. This occurrence can be explained by the different pKa values and the ultimately formed complexes. While neutral complexes are formed during the use of 2-mercaptoethanol, which lead to longer retention times, the use of l-cysteine results in charged complexes which have less interaction with the column and thus a shorter retention time . This can be helpful when analyzing real samples due to the large excess of inorganic mercury, which can lead to overlapping of the smaller CH3Hg+ peak. Ion chromatography also belongs to the group of liquid chromatography and describes a further effective and fast method for specifying mercury species [38, 179]. It is characterized above all by the use of cation exchange columns and the absence of organic solvents, why IC is often described as a “green” method . Despite the good properties of this separation method, there is so far no application for sediments. The capillary electrophoresis is another separation method which is characterized by good separation efficiency, high resolution, high separation speed, low sample consumption and the lack of interaction between analyte and capillary . Despite the many good features of this separation technique, the main drawback of CE is a lower sensitivity compared to LC and GC. By coupling to element-specific detectors, such as ICP–MS, the sensitivity can be positively influenced, but the coupling may lead to undesired memory effects . As a result, the CE has little use in specifying mercury. Numerous detection techniques are discussed in the literature, which are coupled with the above mentioned separation techniques when specifying mercury. Depending on the analyte and the chosen separation method, the appropriate detection method can be selected. For the detection of mercury species element specific detectors like atomic absorption spectroscopy (AAS) [181, 182], cold vapor atomic absorption spectrometry (CV-AAS) [183, 184], atomic fluorescence spectroscopy (AFS) [134, 185, 186, 187], especially cold-vapor atomic fluorescence spectrometry (CV-AFS) , mass spectrometry (MS) [146, 150, 189, 190] and inductively coupled plasma mass spectrometry (ICP–MS) [127, 131, 132, 155, 191, 192, 193, 194, 195, 196, 197, 198] are used. Table 7 provides a brief overview of the above-mentioned detection techniques used in many hyphenated techniques. GC and HPLC are the most common separation methods for the hyphenation with an element specific detector. As pointed out before GC has the particular advantage as it allows a quantitative transfer of the sample, without previous nebulization. The detection systems used for the coupling with GC are usually AFS [126, 199, 200], ICP–MS [201, 202, 203] and as alternative a common MS [144, 204]. AFS and ICP–MS are widely used for the detection of several elements, especially of mercury, arsenic and selenium  and are characterized by high selectivity and sensitivity. AFS is also characterized by low costs as well as easy handling [38, 205]. Because of the mentioned advantages, the AFS was particularly popular in the 1980s and 1990s and is still a suitable detection method for the speciation of mercury. Especially in combination with the advantages of gas chromatography, it is one of the most popular methods for the speciation of trace metals . Though less common than other combinations, GC-MS offers a simple and inexpensive alternative to GC–ICP–MS and GC–AFS [144, 194]. Nevertheless it is characterized by higher limits of detection, which can be crucial when analyzing trace metals in various matrices. In addition to high sensitivity and selectivity the coupling of GC and ICP–MS (Table 8) offers also the possibility of a multi-element analysis and unlike other methods, it is characterized by the opportunity to show artifacts using speciated isotope dilution mass spectrometry (SID-MS) [3, 20, 66, 206, 207, 208, 209, 210]. However, it must be pointed out that all hyphenated techniques including GC require a derivatization step as it is only suitable for volatile species. To form more easily volatiles sodium tetraethylborate  is commonly used. But according to the literature derivatization may be time consuming  and artifact formation has to be feared . To overcome these challenges usually LC methods are used. LC–CV–AFS is a widely used technique as it allows low detection limits without prior derivatization. Further advantages are lower running costs and simplicity, compared to LC–ICP–MS, by providing higher sensitivity. Using this hyphenation it is essential to imply an additional step for the conversion of organic to inorganic mercury with a suitable reagent, in general sodium borohydride or tin(II)chloride . In addition, no control of artifacts can be achieved using appropriate isotopic standards. Other detection systems used in combination with HPLC are presented by ICP–AES, ICP–MS, CV–AAS and API–MS . Whereas in view of the particularly low detection limits (ppb-range ) the use of ICP–MS as detection method is preferred. Despite the higher operating costs and lower sensitivity compared to AFS , ICP–MS, especially in combination with HPLC, offers a wide spectrum of analytical methods. Based on its capabilities, ICP–MS is a detection method that is closest to the ideal for optimal detection (low detection limits, wide linear range, ability to measure different isotopes, application of isotope dilution [3, 119, 122, 208]). Therefore the use of ICP-MS has grown enormously, which can be confirmed by the high number of publications . Compared with the other mentioned coupling types, the combination of the HPLC (easy sample pretreatment, no derivatization required, various number of separation methods) with ICP–MS as detection technique leads to a powerful hyphenated technique for the speciation of mercury in sediments. According to the World Health Organization, mercury is one of the most dangerous substances. The reason for this is the occurrence of mercury in different species, which differ in their degree of toxicity. Due to this fact, a speciation is indispensable for the evaluation of the environmental condition. The speciation can be divided into several sub-sections, which are defined by extraction, enrichment, separation and detection. When choosing the right methods, artifact formation is a crucial factor that must be taken into account, as this can lead to incorrect interpretation of results. For the correct evaluation of speciation methods reference materials are often used. Some reference materials are already available on the market for mercury speciation in sediments. However, these are often certified only for the total and methylmercury content. Since there are also other species available in sediments, it would be useful to offer reference materials that are also suitable for the analysis of these. 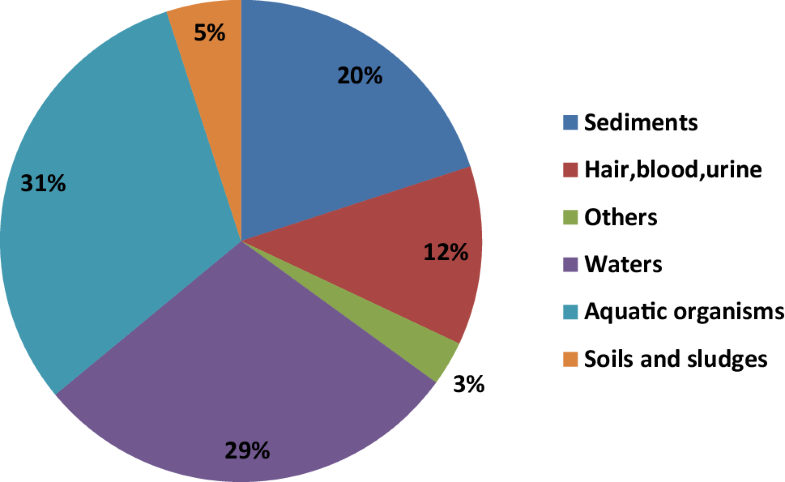 Above all, sediments, in which the methylmercury concentration is only 0.1–1% of the total mercury content, must be treated with special caution. For the extraction of sediments mainly acidic, alkaline or distillative methods are used. However, the acid extraction is the most common technique and is used in various modifications. As already mentioned, the concentration of methylmercury in sediments is very low, a suitable enrichment method followed after extraction is necessary. For the enrichment of mercury species solid phase extraction is a very frequently used method and provides a number of different phases, e.g. thiol-containing compounds with a high affinity for mercury. After a successful enrichment, the separation of the species with a suitable separation method takes place. HPLC and GC are the most commonly used methods for this purpose. Both methods have their advantages and disadvantages, but a considerable disadvantage of GC is the necessity of derivatization. This required step leads, beyond additional time, to the formation of artifacts. Due to the lack of a need for derivatization and the enormous variety of separation phases, HPLC has many advantages in specifying mercury in sediments. A number of detection methods are discussed in the literature, while (CV)-AFS and ICP–MS are the most common. Despite the many mentioned advantages of (CV)-AFS for the speciation of mercury, ICP-MS has the essential advantage that it does not need any derivatization. In addition, this technology is characterized by the significant advantage to show artifacts using speciated isotope dilution mass spectrometry. Nevertheless by checking the literature of the last five years, a trend towards the use of GC based methods in combination with CV–AFS becomes obvious. In addition, it is mainly referred to the use of existing methods (e.g. USEPA 1630) and shown little new methods [47, 77, 122, 124, 125, 169, 219, 220, 221, 222, 223, 224, 225, 226, 227, 228, 229, 230]. Based on the ease of use, robustness and low running cost , the combination of GC and CVAFS seems to have a firm place in the speciation of Hg. Due to the complexity of the speciation of mercury in sediments and the resulting high number of publications in this field, this review should give an overview of the existing methods and consider them critically. Background is the property of sediments, in particular, to bind heavy metals and release them depending on environmental conditions. Accordingly, they serve as risky storage that needs to be controlled. Therefore, the goal is to find a working, robust standard method that is suitable for different sediments. Financial support from the Federal Institute of Hydrology is gratefully acknowledged.